CARLTON LANDING, Okla. — Lake Eufaula is a place for fun on the water year-round. 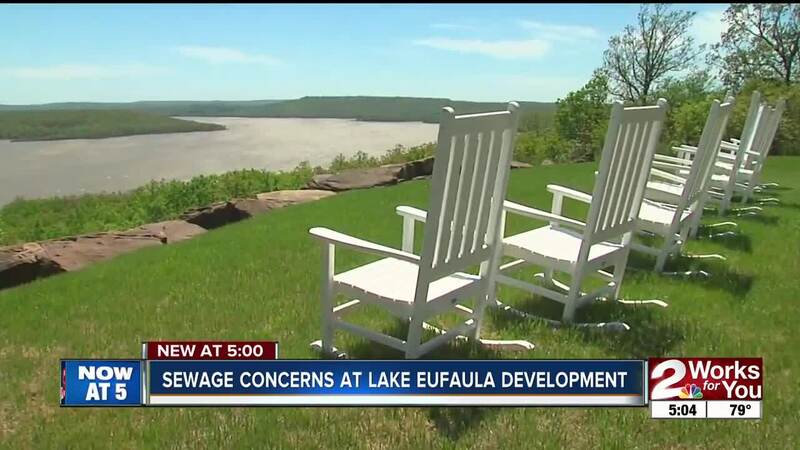 Now some people who live there are concerned Oklahoma's newest town is dumping sewage into the lake. “The idea that you know that's going in the lake just… doesn't sit right,” lake resident Deborah Hughes said. There are all kinds of housing developments on Lake Eufaula, but none of them really compare to Carlton Landing – it’s exceptional, and people know it. Hundreds of acres of beautiful views of the lake, their own school, restaurants and homes of all sizes and price ranges. More than 200 homes already are built with plans for hundreds more. But some local residents say Carlton Landing has grown too fast and does not have its sewage and water system figured out --- and it is dumping overflow into Lake Eufaula. Carlton Landing developers say that's just not true. "The idea that you know that it’s going in the lake just doesn't sit right," Deborah Hughes said. Carlton Landing developer Grant Humphreys disagrees. “The reality is that we've been working with DEQ since spring of 2016 for the new plant,” he said. Humphreys says Carlton Landing hopes to have its own water treatment facility up and running in the next few months. We reached out to the Oklahoma Department of Environmental Quality. They didn’t have anyone available for an interview today, but they tell us the developers of Carlton Landing are in compliance with all regulations right now.